Sporty handling combined with outstanding looks. The KW coilover kit Variant 1 "inox-line" is our entry model for more driving pleasure with an attractive and individually adjustable lowering. 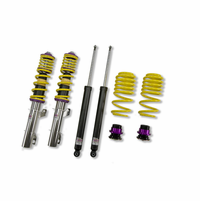 Due to its high-quality finish, the use of struts made from stainless steel, corrosion resistant springs and bump stops as well as compatible components stands for long driving pleasure - not just the car's life. 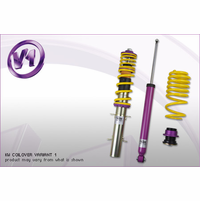 With the KW coilover Variant 1 you can achieve maximum lowering in the T�V-tested adjustment range. Depending on vehicle model this varies between 30 to 70mm or 50 to 90mm. Even after years you can adjust the height quickly and easily due to the dirt resistant trapezoid thread and composite collar. Lowering at the front axle is made using our one piece composite height adjuster, on the rear axle this is the same unless the car has a seperate spring and shock absorber. The supplied rear height adjuster sits either above or below the rear spring. 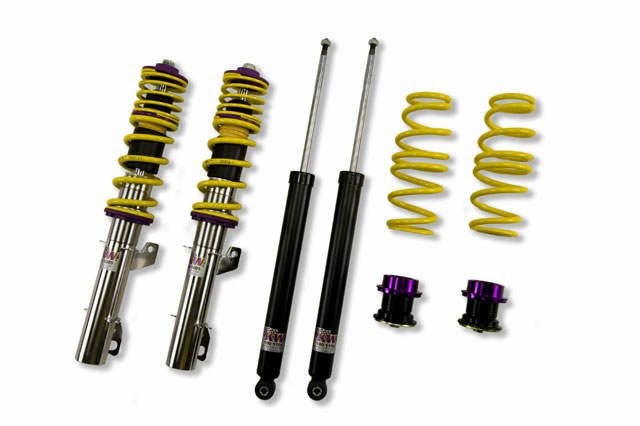 KW coilover Variant 1 "inox-line" satisfies the sporty driver with its harmonic basic setup. Our engineers develop for each vehicle a specific damper setup and spring rate to increase the driving pleasure with optimal balance of sportiness and practicality. 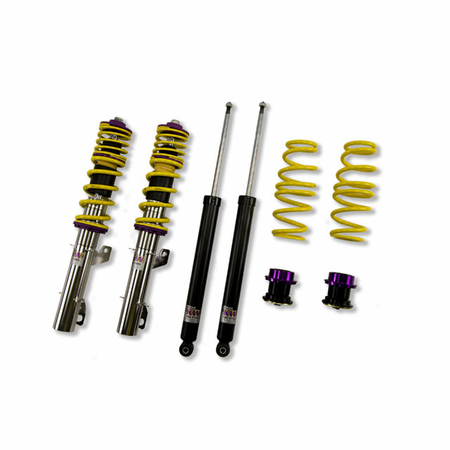 In the end, you don't buy any coilover, but a KW coilover which has been developed specifically for your type of vehicle. KW as a manufacturer uses only its own resources, high quality components and the same damper technology as high-volume manufacturers. With the KW coilovers Variant 1 "inox-line", rolling motions of the body will be reduced during compression and you benefit from genuine directness and sportier handling while driving. We are the market leader and innovator of individual suspension solutions for road and racetrack for more than 15 years. No matter where in the world, car driver, automotive manufacturers and tuners rely on our KW coilovers "Made in Germany". Each KW coilover kit, developed and manufactured in the Swabian town Fichtenberg, is subject to extensive stress tests during production to meet the high standards of our KW quality management. Of course, we give as a German manufacturer a 2-year warranty on our more than 4600 applications suspension solutions, which exceed OEM quality. The warranty will increase up to 5 years when the kit has been installed at one of our KW specialist dealers.